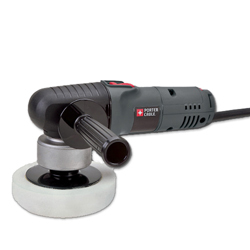 The Porter Cable 7424 XP is the ultimate dual action car polisher! The Porter Cable 7424 XP Variable Speed Polisher is the most user-friendly, paint-safe car polisher on the market! The Porter Cable 7424 XP polisher makes product application, polishing, and buffing faster and more effective than detailing by hand. With variable speeds and a dual-action pad, this polisher is great for novice detailers or seasoned pros that just enjoy the ease of use. The Porter Cable 7424XP dual action polisher has a host of features that put it in a league all its own when it comes to safety and durability. And the shine on your vehicle will be proof positive that this is one fantastic polisher. Choose from money-saving polisher kits including the Porter Cable 7424 XP polisher, foam pads, and buffer accessories. We offer the Porter Cable 7424 XP polisher alone, with pads, and in complete buffer kits with the polisher, pads, and polishes. All kits are packaged to give you the best value. Additional discounts are not applicable. These are the kind of people that I enjoy conducting business with, no hassle, you get what you order plus some extra goodies thrown in. Orders are boxed perfect to protect the product and they arrives in a very timely manner. I really like the products, there are so professional so as to help you keep that customized vehicle looking new. I've had a lot of head turning and awesome comments about the Silver Fox (2004 Chevy Avalanche, Birch Silver). I have a great deal of time on my hands since I have retired, but the truck gives me something to play with and rewards me with a beautiful piece of work to be proud of. The products are so amazing and so easy to work with, and the end result is overwhelming. Well I'm straying away from the fact that I would highly recommend doing business with these professional folks to anyone anytime. Thanks for this opportunity to express my opinion.